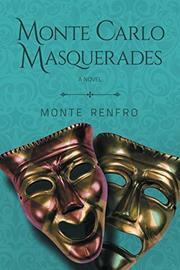 A debut mystery novel delivers an opulent historical setting: Monaco in March 1914. It is the height of “the season” in Monte Carlo, and the quarter practically overflows with Americans, Brits, Russians, and Germans. Among the wealthy and royal revelers are Mr. and Mrs. Joseph Murphy from San Francisco. As the book opens, Murphy has been found dead in his bed in Monte Carlo’s prestigious Hôtel de Paris, a bullet hole in his back. Mrs. Murphy’s heirloom diamond and emerald necklace is retrieved from Joe’s pocket. But wait! The necklace is “paste,” a cheap duplicate. The original is missing. A German dictionary is found by the body; a mysterious pair of train tickets to Ireland is uncovered. When the coroner later discovers that Murphy died from an allergic reaction to a bee sting, Chief Inspector Gautier wants to drop the case even though poisoned whiskey was also found on the night table—shooting a dead person is not a crime. Mrs. Murphy and her detestable cousin, Ted Wycliffe, want answers, and her American secretary, 21-year-old Lily Turner, the female lead of this drama, wants to recover the stolen necklace to secure the reward money. It turns out that Lily has taken the secretarial position to help fund the budding detective agency she and her friend Fran Jameson have recently established. The primary male protagonist, 40-something Paul Newcastle, a surveillance director of the Monte Carlo Casino, is partnered with Lily to protect the hotel’s reputation. The cast of characters grows; murder suspects multiply, as do the killings; and everybody has a secret back story that is revealed only gradually as the complex novel progresses. Monte Carlo is filled with spies (the lead-up to World War I forms a silent backdrop), not to mention a major arms dealer. Readers will have to stay on their toes to keep track of all the subplots and interconnections. Renfro’s prose is stylized and meticulous despite the occasional missing or misplaced word that should have been caught in editing (for example, “Was it was the one you identified”). The author deftly duplicates the flourishes of early 20th-century language and provides her narrator with a pleasant hint of sarcasm. Here is Lily sizing up Paul, whose top-drawer presentation is many layers removed from his guttersnipe heritage in Liverpool: “This time, Lily focused on the posh accent. Possibly pure gold. Possibly pinchbeck. She was incapable of detecting the slips in diphthongs or variations in vocabulary that betrayed the metal’s baseness.” Paul is the most complicated character, a skillful con man planning his next big score yet haunted by a past tragedy and a betrayal by his nephew. Lily is a formidable heroine—smart, pretty, determined to make her own way in the world. Enhanced with historical tidbits and vivid descriptions of Monaco and its habitués, the narrative is engaging and fun. This is an old-fashioned mystery that is chock full of twists, humor, and sophisticated writing. A delightful, well-designed ride for readers who enjoy a long journey down a road filled with intriguing detours.